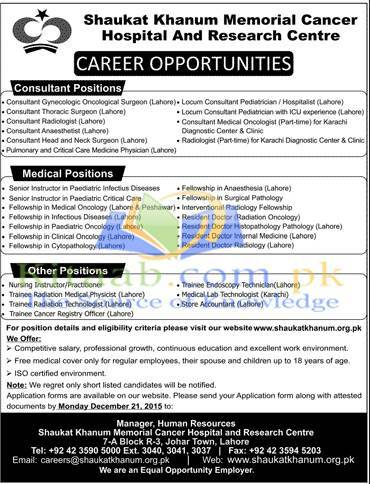 Shaukat Khanum Memorial Hospital is has invited applications on various job vacancies. If you are interested to get these jobs, please submit your applications as soon as possible. Dates will soon be mentioned here. Jobs are being offered on many different posts including; Consultant Gynecologic Oncologic Surgeon, Consultant Thoracic Surgeon, Consultant Radiologist, Consultant Anesthetist, Consultant Head and Neck Surgeon, Pulmonary & Critical Care Physician, Senior Instructor Peadiatric & Infectious Diseases, Fellowship in Medical Oncology, in Paediatric Oncology, in Infectious Diseases, in Anesthesia, in Clinical Oncology, in Radiology, Resident Doctor of Radiation Oncology, Nursing Instructor, Trainee Radiation Medical Physicist, Trainee Radiation Technologist, Cancer Registry Officer. For updates regarding these jobs please stay in touch with us. Important dates and other details will be updated here as soon as we get them.